So I've gotten a little behind with my Black Panther updates. I apologize for that because I know people have been looking for a continuance of what was started. My Marvel-related posts have turned out to be some of my best traffic-generating content so far in this first year of Black and Intellectual's history. I'm going to be getting up to date over the next couple days and will be back on track. This entry will cover Issues #4 and #5. The next entry will cover issues #6 and the most recent #7. If this is your first time reading my Black Panther issue reviews, check out my previous entries first. So sit back and enjoy the ride...as well as Brian Stelfreeze's incredible artwork. We begin the issue with T'Challa being debriefed as to the going's on's in his kingdom. We learn that even though Zenzi has been neutralized (see Issue #3), Tetu, the Shaman is still at large and they don't know where he is. They simply know he's connected to Changamire in Birnin Azzaria (see Issue #2) who acted as his pupil at one point in the past. T'Challa and Hodari discuss events going on throughout Wakanda. We also see the limits of the power of the Black Panther right now to stop his country from descending into chaos as Hodari (the main debriefing him) elaborates on the happenings in Northern Wakanda with regards to the Dora Milaje. They have destroyed the forces of the local militia bosses controlled by Man-Ape and have began tribunals. They are writing laws and forcing elections locally. Hodari makes T'Challa aware that this isn't merely a small matter, that it is in fact a revolution. The revolutionary leaders in this case being not Zenzi and Tetu, but Ayo and Aneka formerly of the Dora Milaje. Later on in the issue, we see Tetu at an undisclosed location first the first time coming in contact with Aneka and Ayo. Up until this point, these side stories haven't been connected and they now appear to be coming together. Tetu seeks the aid of Aneka and Ayo, the Midnight Angels, in his struggle against T'Challa. It's the whole 'separated we can be defeated, but together as one we are unstoppable' lecture that he gives them. They say that they are aware of what Tetu has going on with the King, but they decline to join him at the moment. This issue ends tragically I'm afraid. T'Challa gets advice from the Queen Mother with regards to how to move forward in a country being torn apart and with a populace that no longer respects you and some see you as a traitor and/or unfit for leadership. He decides to hold a massive rally of sorts to simply be "with the people." To positively reaffirm his support with his followers. Elsewhere however Tetu continues to plot against the throne of Wakanda after being rejected by Aneka and Ayo. We see him reviving Zenzi who apparently was still unconscious up until this point, then we see Tetu conspiring with a man named Ezekial "Zeke" Stane. He is the son of Obadiah Stane who some might remember being the main villain in the Iron Man 1 film. Zeke Stane has been an enemy of Tony Stark in the Iron Man comics in the past...now apparently he's popped up in Wakanda. He convinces Tetu to commit what amounts to be an act of terrorism at the rally the Black Panther and the Queen Mother attend. The casualties are high and as of right now it looks as if one of the casualties is the Queen Mother herself! The aftermath of the terrorist explosion from Tetu with the advice of Zeke Stane. The Queen Mother lays dead in T'Challa's arms. At the very beginning of this issue, the Black Panther is seen having a conversation with a mutant character named Manifold. This makes Issue #5 the first issue where we see heroes from different comics make an appearance in this new Black Panther run. Manifold is the character seen on the cover of this issue as well. He has the power to bend space and time, which makes him an incredibly strong ally for T'Challa to have right now. A roundtable of despots, dictators and tyrants. Since the end of Issue #4, T'Challa and Manifold have been conducting raids around the country. At the beginning of this issue, they come across a room where it looks as if Wakandans have been kidnapped and the terrorists were experimenting on them. They have some sort of glowing device in their chests similar to what Tony Stark has in his...which implies that the experimentation is connected to Zeke Stane somehow. 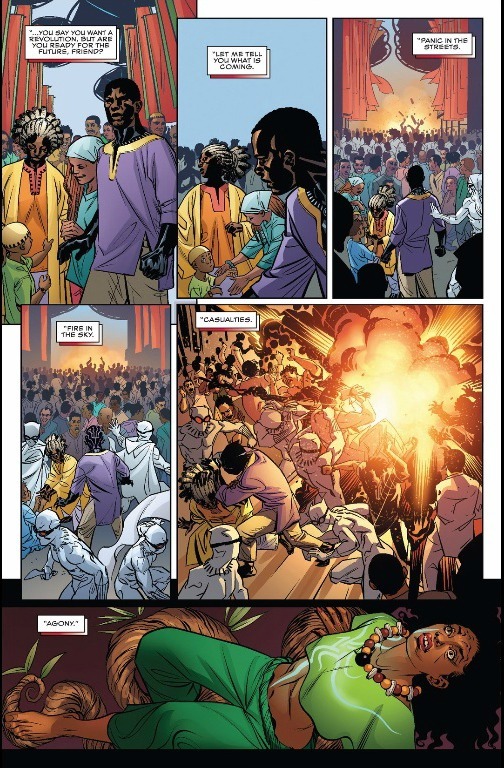 Later, we see T'Challa doing something you wouldn't expect to see him do, but it shows you the difficult time he is having quelling the uprisings occurring across his land. He employs the advice of five different heads of state. Leaders of brutal countries who are used to stamping out rebellions. One of the heads of state says that all of them except T'Challa has experience keeping nations under their feet (a play on the current mini-arc this volume is in) and that if the Black Panther wants to keep his, then he should return to his old ways. We once again return to the Djalia as we see Shuri training with a spirit showing herself in the image of the Queen Mother. She tells Shuri about the ancient Adowans who came in contact with the ancient Wakandans as the both of them train. She tells of how a foreign group came into Adowa seeking tribute under the assumption the Adowans were weak. When the group returned a second time, they found the court empty, the treasury depleted and no one in sight. They immediately became worried and afraid just as they were cut down by spears and arrows. The spirit tells Shuri that the point of this story was to explain to her that she they are either a nation or they are nothing! On the next panel, we see the Black Panther interrogating one of the Wakandans with, what we now know to be a bomb, cut into his chest. Remove the bomb, and you kill the man. Something T'Challa didn't want to do because he needed information from him. It must've been a man like this who bombed the rally back in Issue #4. The man he speaks to however has lost all faith in the rule of the Black Panther and in T'Challa. He mourns the death of loved ones from past events in Wakadan lore (Black Panther Volume 5, Secret Wars, etc) and blames T'Challa for all of this. T'Challa being the master statesman he is, convinces this potential terrorist to give him the information he seeks. He gets the man to admit that what he wants to do, kill women and children, is not honoring the lives of his lost relatives. They form a pact. Surprisingly, in the next panel (pictured above) we find out that one of the dictators that came to Wakanda at T'Challa's request named Jorick Kroawl of Genosha was actually a double agent working with Zeke Stane, Tetu and Zenzi!! He tells the three conspirators what was discussed and asked for his fee. Like all villains, Zeke does what they do...and kills the man. On the final few pages, we see that before Zeke killed the Jorick, he had been recording the entire conversation. So the truth about what was said at the secret meeting is leaked all over the media for the entire country and world to see. They've remained one step ahead of T'Challa for the entirety of the first 5 issues. So now everyone thinks the Black Panther is about to starting burning crops, killing the husbands of women and sleeping with them and killing the children of dissidents. Zeke didn't leak the part where Jorick states that T'Challa declined to do all of this. This is getting good, the political drama in this story is building up to something great indeed!